Join Booty Bands’ Danita Young as she leads a challenging workout, followed by meditation. Partnered with the San Diego Junior League for an inspiring day. CARLSBAD, CALIFORNIA, UNITED STATES, June 28, 2018 /EINPresswire.com/ -- San Diego, California: Booty Bands® would like to officially invite all of you to join Booty Bands® and the San Diego Junior League in an event to be held on June 30th. 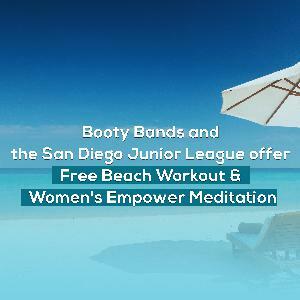 In a statement released earlier today it was revealed that Danita herself will be co-hosting the event with the San Diego Junior League and will be leading all the fun filled activities that will involve some Booty focused workouts and self-love meditation. As far as participation is concerned, the entry to the event is completely FREE so all Booty Bands® admirers from the area are expected to show and join Danita at the venue for a fun filled day. The statement also revealed that all participants of the event will be provided a Booty Band each to go through the entire sessions with Danita herself leading the way. However, it was also advised that all participants consider bringing in their own exercise mats, water bottles to keep themselves hydrated and loads of energy to last throughout the day. To add more flavor to the event, the participants involved will have to go through a series of small activities and all of them will be eligible and aspiring to win a UNIQUE MERMAID BOOTY BAND to take home! As Booty Bands® are expecting the event to be a huge hit, the entry to the event has been made on a reservation basis. All entries are going to be entertained on a first come first serve basis, however, all eager participants are to send an email to bootybandsofficial@gmail.com to reserve a spot for themselves. The title of the email is to be made “Booty and Self Love RSVP” for all entries to be considered valid. This step has been taken in order to facilitate all incoming entries on a comfortable level and not cause any problems for both the participants and the organizers. So all interested participants are expected to send in their RSVP emails as soon as possible to avail the limited slots available. Instagram: https://www.instagram.com/bootybandsofficial/ to stay updated with all that is going on with the company and stay updated with other similar events happening in the area.